Background: Patients that have major lower jaw deficiencies with malocclusions should be ideally treated by a combined orthodontic-orthognathic surgery approach. This is particularly relevant when the patient is young. But some patients never seek treatment for their jaw deficiency until they are older or do not have the desire or resources to go through this more comprehensive approach to their facial skeletal problem. As a result these types of patients present for jaw augmentation seeking cosmetic improvement. While a traditional chin implant can be used it only provides a very modest augmentation effect. With the maximum standard chin implant projection of 10mms, this falls way short of the 15 to 20mms of ideal horizontal projection that us often needed and does address any vertical chin deficiency nor the rest of the deficient jawline behind the chin. Such patients often come to me seeking a total jawline augmentation approach using a custom implant. With a large implant ‘load’ required in the chin if this approach is used, the stretch of the soft tissue chin pad beneath it may not allow it. And even if it did it may not be a prudent long-term decision with the pressure of a large implant potentially creating a tissue thinning effect over time. 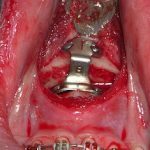 Under general anesthesia and through an intraoral approach, a sliding geniplasty was done giving the chin 12mms of horizontal projection and 5mms of vertical elongation. Due to the large bony gap that resulted, an allogeneic (tissue bank) cancellous bone block was used to partially fill it in. Taking a two-stage approach to jawline augmentation in more significant deficiencies reduces the eventual implant load on the chin. The first stage sliding genioplasty allows the majority of the eventual total chin augmentation to be of an autogenous composition. 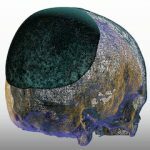 While the second stage custom jawline implant will still be designed to cover the chin, the implant volume across the chin bone will be much less. 1) Large chin augmentations in jawline implant patients may be best suited long-term to have a first stage sliding genioplasty. 2) In large sliding genioplasty advancements an interpositional bone graft helps with both healing and in postoperative chin shape. 3) Once the chin is healed a custom jawline implant can be done four to six months later.